Josh Benson is one of dozens of former NA3HL players who earned an NCAA commitment this season while playing in the NAHL. No other Tier III junior league advances more players annually to the NAHL than the NA3HL. Recently, the North American Hockey League (NAHL) announced that it had yet again set a new single-season record for NCAA commitments. Currently, the NAHL has 313 (and counting) so far during the 2017-18 season. That also includes a new record number of 223 NCAA Division I commitments. It once again re-emphasizes that no other junior league in the world saw as many NCAA commitments for their players, while they were actually playing in the league. Playing a significant role in these NAHL commitments were a nice list of former NA3HL players. In total, 24 of the NAHL players (see list below) who had NCAA commitments during the 2017-18 season are alumni of the NA3HL. The bottom line is when it comes to player advancement, the NA3HL is a step above the rest. The fact remains that when it comes to Tier III junior leagues, no other league has had more movement and advanced more players onto play in the NAHL than the NA3HL. The NA3HL also saw over 130+ college commitments in 2017-18, with the number still growing. Almost 70% of those college commitments were NCAA commitments. The NA3HL continues to make their mark in advancement of players. A total of 51 former NA3HL players played in the NAHL during the 2017-18 regular season. In addition, 24 more current NA3HL players were tendered by NAHL teams to play in the NAHL for the upcoming 2018-19 season. The NA3HL is the only league that has an exclusive NAHL tendering system available only to NA3HL players. 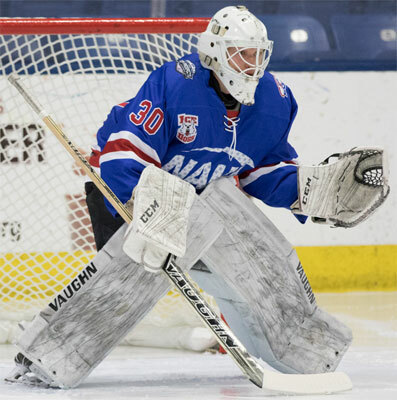 Former NA3HL players have been a big presence currently at NAHL main tryout camps the last two weeks, with dozens being invited to NAHL training camps to start the season in August. NAHL coaches are also very clear and supportive of the NA3HL to NAHL development path. “It is a development ladder and we are trying to get those kids onto college as well. As a former NA3HL coach and now NAHL coach, I can tell you it is a numbers game. There are only 23 spots on an NAHL roster and when we need a player, the NA3HL is one of the first places we look because they do a great job of development. The amount of kids that get moved back and forth is great and a lot of people don’t see that. They just look at who is on the roster to start the season. However, we are always moving players between the two leagues and there has never been more movement that we are seeing currently,” said Austin Bruins head coach Steve Howard, who formerly was a head coach in the NA3HL. “Everyone’s path is different. No matter where you are at, there are situations that arise in hockey that are challenging. I coached for two years in the NA3HL and the path works and is successful if the players take ownership of it and put in the hard work. Players need to commit to the lifestyle that is going to make them successful and conduct themselves in a serious manner. That means training, nutrition, and discipline that will help them achieve their goals. The players that have moved onto the NAHL and beyond all have that in common,” said Chippewa Steel head coach Al Rooney, who was also a head coach in the NA3HL for two seasons. One of the main benefits of the direct relationship with the NAHL is the presence of NAHL Central Scouting at all the NA3HL events during the season, which includes the NA3HL Showcase, the NA3HL Top Prospects Tournament and the NA3HL Silver Cup Championship. NAHL Central Scouting is solely dedicated to finding NA3HL hockey players, evaluating them in a true unbiased manner and then organizing and providing that information to NAHL teams and college coaches. No other junior league in the United States has a system like it, where its primary mission is the advancement of players. “NA3HL players have played big roles on our team. It is a pathway that has proven itself to work. The players have come in, contributed, and then gotten looks from the higher level. It is a unique situation because of the close bond between the NAHL and NA3HL,” said New Jersey Titans head coach Craig Doremus. “Everyone develops differently and sometimes and player isn’t quite ready. We have had great success with NA3HL players. I have been able to take kids out of the NA3HL and turn them into NCAA hockey players. You can only play junior hockey for a very short period of time, so I tell guys that junior hockey is never over until you age out. Everyone develops at a different rate and time. Go play a year in the NA3HL, develop, and then you will be on our radar,” said Wilkes-Barre/Scranton Knights head coach Tom Kowal. © 2019 New England Stars. All Rights Reserved.